WASHINGTON — Americans are eating more shrimp than ever — about three times more than 35 years ago, Consumer Reports says — but that means shrimp is coming from many more places than in the past. And some of those sources may not follow the safest, cleanest procedures. About 94 percent of American shrimp is imported, the magazine says. And most of that shrimp is grown in farms — huge man-made tanks into which shrimp are densely packed and fed foods that may be laced with antibiotics. That can lead to unsanitary conditions if farmers aren’t careful. Consumer Reports adds that labels are rarely of much help; sellers may not even know from where their shrimp came, and the more expensive stuff isn’t necessarily better. Wild shrimp is far less likely to have harmful bacteria than farmed, Consumer Reports says. If you do buy farmed shrimp, it recommends looking for shrimp labeled Naturland, Aquaculture Stewardship Council or Whole Foods Market Responsibly Farmed — they’re far less likely to have antibiotics. The magazine’s testing didn’t find a whole lot of difference in taste between wild and farmed shrimp, though. Fresh vs. frozen? No contest: The only really fresh shrimp you’ll find is at a gourmet seafood market or a seaside store, Consumer Reports says. All other shrimp sold as “fresh” was frozen at some point, so don’t bother paying the extra money. 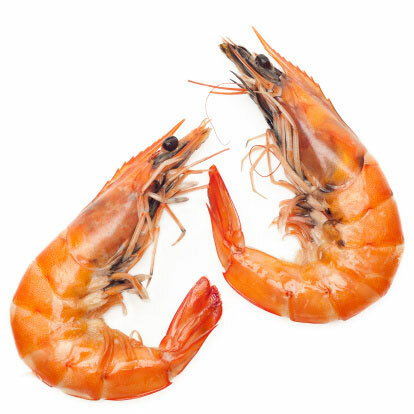 Precooked shrimp may be convenient, but the magazine found bacteria in a few cooked samples. Buy the shrimp raw and cook it yourself — that should kill any bacteria. Wild shrimp is the best choice for shrimp without antibiotics or bacteria, but then again wild shrimp farming has an environmental impact. If you go wild, Consumer Report says, look for shrimp certified by the Marine Stewardship Council; shrimp from Whole Foods Market; and those listed as “Best Choices” or “Good Alternatives” on seafoodwatch.org. Beware of “seafood fraud,” the magazine says. Claims such as “organic,” “natural” or “environmentally aware” sound nice, but there aren’t any real standards to make those terms mean anything. And a lot of shrimp sold as wild isn’t really. Consumer Reports says to look for — well, poop: The “vein,” as it’s called, is really the digestive tract. A clean tract may be less gross, but that means a farmer stopped feeding the shrimp before the harvest. In its investigation, Consumer Reports tested raw shrimp for bacterial contamination, specifically for vibrio, Staphylococcus aureus, E. coli, listeria or salmonella. The chart below shows the bacteria levels found. Cooking raw shrimp should kill the bacteria.